John Stewart is in dire straights. And I do not mean the band that dates. Guy is aghast. The Guardians won't last. And the rest of the Corps are looking for Bill Gates. Or else they could be looking at something by Writer: Peter Tomasi; Artist: Fernando Pasarin; and Publisher : DC Comics in May 2012. In 'Alpha War', both Guy Gardner and John Stewart find themselves in a right ying-tong-song. No doubt about it. How so? Well, it is fairly safe to say that Green Lantern, Guy Gardner, is having some really strange emotional ups and downs at the moment. He is annoyed with Salaak due to the fact that he and the Corps have to reposition the Sinestro power-battery on Oan soil. He is surprised with the Guardians for rewarding him for his past triumphs. He is smug when he handles a dispute back at his bar, Warriors, in a rather bold manner. And he is blown away when the Alpha Lanterns suddenly show up and arrest John Stewart. "We are not... screwing with you". Always nice to hear fringed people defrost. The overall structure of this tale lent an air of suspense to it. It started off with the Alpha Lanterns talking about "What they had to do". Then the majority of the issue dealt with Guy and his new state of play. And finally it ended with a dozy of a cliff-hanger. Predictable. But still a dozy. I suppose on some level, the best thing about this story could also be the worst thing about this story too. 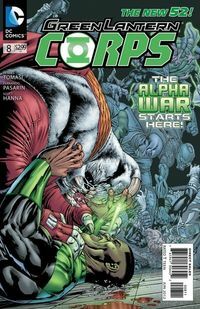 It was inevitable from the get go that this issue would end with the Alpha Lanterns confronting John Steward. Not a massive gripe, granted. A little niggle at best. STORY: The best scene for me in this story was the one between Guy Gardner and the Guardians. It has been quite some time since I saw Guy having a good old belly laugh at himself, as well as how other people perceive him. I myself had a good chuckle whilst reading this segment, because it brought me right back to the BWA-HA-HA era of the Justice League International. Bless 'em. ART: Solid. Solid. Solid. This issue had some detailed and appropriate paneling to tell the tale that it wanted to tell. I particularly liked the Sinestro power-battery splash page (nice depth of field), and the fight in the bar with Guy and the gang (well paced). Good job Pasarin and Hanna, your a class act. THE 'SCREWING' GUARDIAN: Now you need the right type of actor to be able to pull of this type of shtick. He has to be small. Serious Looking. And kind of funny looking too. Toby Jones from 'Infamous'? Agreed. POLAR-BEAR LOOKING B*TCH: Now for this role you need an actress who does not take herself too seriously, has a 'bigger than life' physique, plus looks like she could take a punch in the face from Guy sd well. Simple. Cheryl Fergison from Brit-soap, 'Eastenders', would be a perfect match. No Man Escapes The Alpha Lanterns. Yet. OK, so we don't have to wait for over a year until John Steward is finally found out as being a 'Lantern murderer'. Nice. Normally most comic books series would drag out this plot-line for as far as it can go, just so it could drain every last drop of emotional truth from behind this concept. But not this series. Thank God. This great one that gets better and better all of the time.